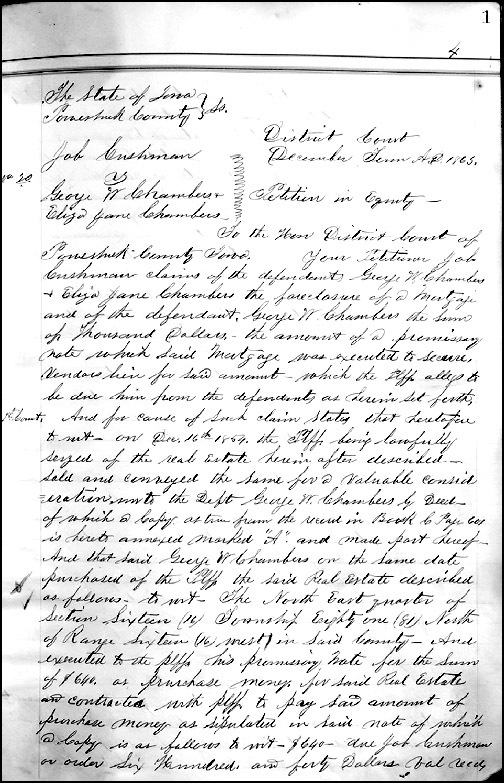 In the December 1865 term of the District Court for Poweshiek County, Iowa, Job Cushman sued George W. Chambers and Eliza Jane Chambers, his wife. An estate created by a conveyance absolute in its form, but intended to secure the performance of some act, such as the payment of money, and the like, by the grantor or some other person, and to become void if the act is performed agreeably to the terms prescribed at the time of making such conveyance. A conditional conveyance of land, designed as a security for the payment of money, the fulfillment of some contract, or the performance of some act, and to be void upon such payment, fulfillment, or performance. A debt by specialty, secured by a pledge of lands, of which the legal ownership is vested in the creditor, but of which, in equity, the debtor and those claiming under him remain the actual owners, until debarred by judicial sentence or their own laches. 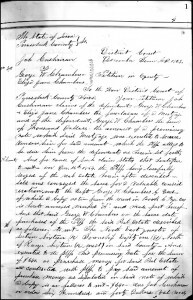 In the Cushman case, the mortgage debt was clearly a debt for the purchase of the land itself — sometimes called a purchase money mortgage. But what’s this lien business? And particularly what’s a vendor’s lien? A qualified right of property which a creditor has in or over specific property of his debtor, as security for the debt or charge or for performance of some act. So, in other words, a mortgage is generally a type of lien — that secured interest in specific land for payment of a debt — and a vendor’s lien is an even more specific type of lien, for a balance owed in the Cushman v. Chambers case on a promissory note given in addition to the mortgage. “The language of the law. Part Latin, part Anglo-Saxon” – and part French. I don’t need to tell you the amount of French in the common law. But it might amuse you to know of an interesting wrinkle. Because Quebec is a hybrid jurisdiction, the common law there is a bit of an alien tongue. I have colleagues who have French as their first language but studied law in English. They practically have had to re-learn their native tongue to talk about the common law in French, because so many common law terms have no real French equivalent so that new terms had to be adapted or coined, or are words that are so obscure that most French speakers don’t know them.